1917, Chadds Ford, PA. – 2009 Chadds Ford, PA.
My first encounter with Andrew Wyeth was in1968 after Houghton-Mifflin published a sumptious, oversized book with reproductions of his paintings on heavy rag paper titled “Andrew Wyeth”. Later, as part of a War for Independence road trip that included Valley Forge and Brandywine Battlefield, my wife and I visited Chadds Ford.[1.] It was there I began to understand the love Wyeth had expressed for his mysterious, tucked-away-world. Wyeth’s subtle, almost invisible egg tempera colours and textures were fascinating. I’d never followed his career and I learned of his death long after his passing. However, something in the spiritual ambience of his work, if not yet quite grasped, remained with me. That missing something was finally revealed in May 2014 when we visited a large and conprehensive Wyeth exhibit in the National Gallery, Washington, DC called Looking Out, Looking In. The exhibit began with numerous watercolours, all new to me and they wove themselves seamlessly into his sketches and paintings. 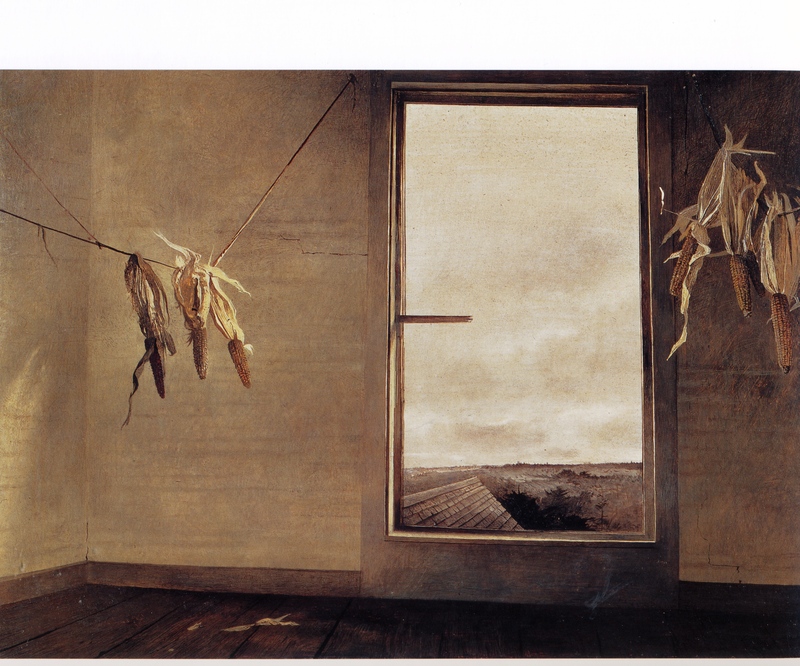 I discovered a nowness that Wyeth had captured – those incredibly timeless moments, the hallmark of a great artist. Many years ago Toru Takemitsu said,”Vermeer is not about colour”. And indeed colour is not what he was about. Nor was Wyeth. Seed Corn, 1948, Private Collection. Cellar Fireplace, 1955, Oklahoma City Museum of Art. 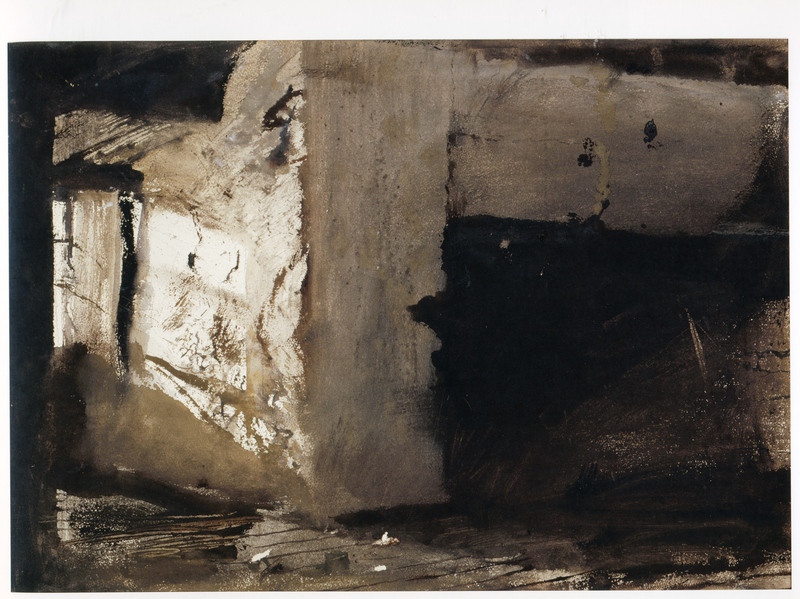 In 1965, Wyeth said that although he was thought of as a realist, he thought of himself as an abstractionist: “My people, my objects breathe in a different way: there’s another core — an excitement that’s definitely abstract. My God, when you really begin to peer into something, a simple object, and realize the profound meaning of that thing — if you have an emotion about it, there’s no end”. Howard Pyle was to my mind a superb illustrator and painter. Pyle painted a great and recently stolen picture of English Grenadier drummers pushing their colleagues up Breed’s (Bunker) Hill towards their second repulse by the “Colonial rabble”. Pyle lived in Chadds Ford as did N.C. Wyeth, Andrew Wyeth’s father, who studied with him. Andrew Wyeth said that illustrators like Howard Pyle painted pictures. 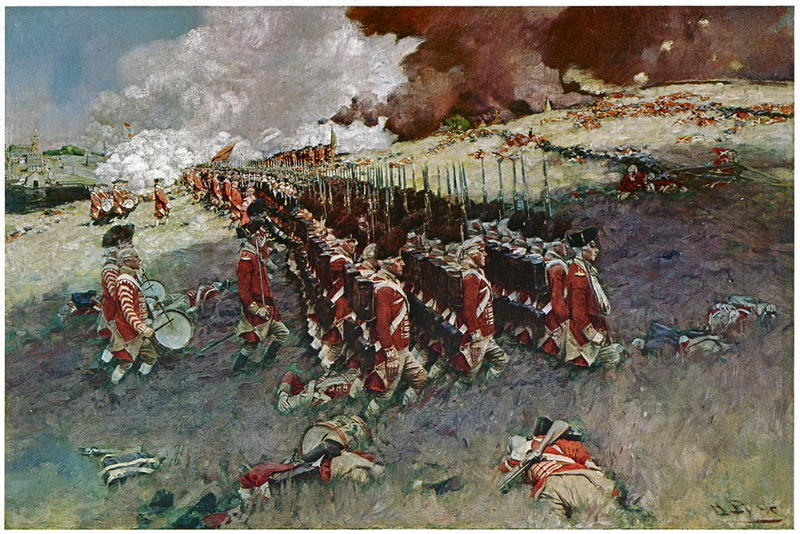 Battle of Bunker Hill, Howard Pyle, 1889. 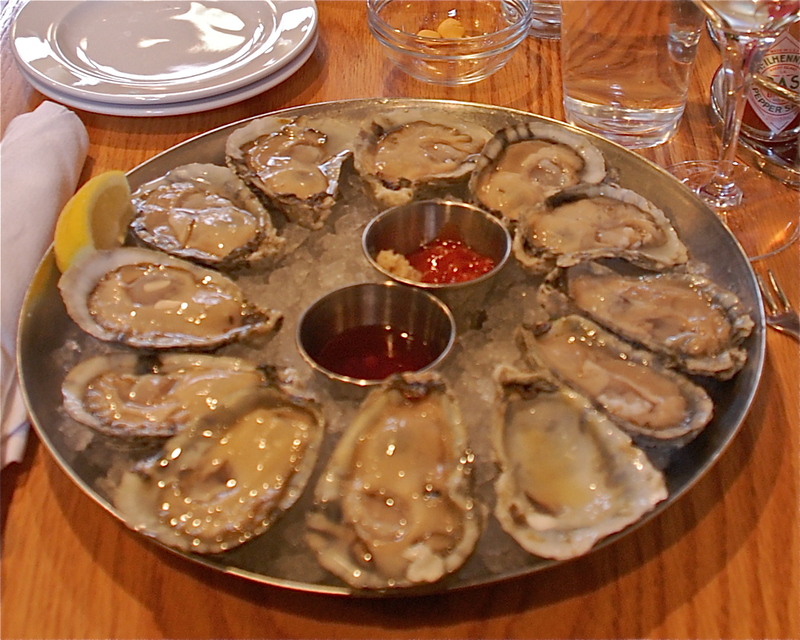 Starters, a Plate of 12 at Hank’s Oyster Bar. Washington, D.C. photograph by R.E., 2009. [1.] Chadds Ford was the major crossing of Brandywine Creek by the road from Baltimore to Philadelphia. The battle was fought 11 September 1777 between approximately 14,000 troops under General George Washington and 15,000 under General Sir William Howe. Though occupying a strong position, Washington failed to send out scouts and his right flank was turned. The defeat led to Howe capturing Philadelphia and Washington establishing winter quarters at Valley Forge. I have one of the Seed Corn prints which I found laying beside a trash dumpster in California. *Do you have any info on this stunning print/lithograph which has hung on my wall for 10 yrs.? Sorry. You could Googlr the Wyeth Museum in Chadd’s Ford and request informtion.